and ionizer system in the world. Ionized water is a powerful liquid anti-oxidant that is easily absorbed into the body. The water also neutralizes free radicals. Ionized water is alkaline water. The molecular structure is smaller than that of regular tap water thereby allowing more hydration, and helping to fight fatigue and maintain good health by cleansing acid waste from the body. Tap water clusters contain 10~13 molecules opposed to the 5~6 molecules of ionized water. This smaller cluster size makes the ion water super-hydrating, or more absorbant. Since our bodies will have more water to work with it can deliver more nutrients to all parts. The advanced computer system is called MICOM. You can control every function with just one touch. This computer's self-diagnosing feature includes analysis of quality, quantity, and temperature of water, as well as the ability to prevent an excessive electric current. There are two chambers separated by a special membrane with very tiny holes, holes so small that water molecules (usually in structured clusters under an electric field) cannot pass through, but large enough for the ionized inorganic minerals to go through. In other words, you turn on the water and push the switch, and instantly you get a stream of alkaline water from the top, and another stream of acidic water from the bottom. The ionizer does not add any chemicals or minerals to the water. It only splits the minerals already in the water to the alkaline side and the acidic side. 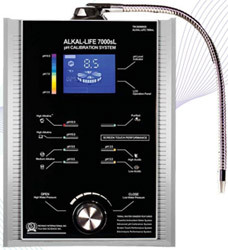 If the water has no minerals, an ionizer cannot make alkaline or acidic water. Alkaline Ionized Water contains many Hydroxyl ions. Hydroxyl ions remove free radicals which are unstable oxygen molecules that cause damage and disease to our body. Once the Hydroxyl antioxidant and free radicals have cancelled each other, the result is that the body is supplied with extra oxygen and energy. Why drink Alkaline water? Alkaline ionized water is different than the water we drink. It contains ions, has a different boiling point, viscosity, surface tension, and can enter our body cells three times faster than ordinary tap water. In general tap water is poorly filtered and exposes us to all kinds of toxins and pollutants. Alkaline water removes impurities and activates healthy minerals into an ionic form which produces "living water". Cooking: Alkaline water retains the vitamin and mineral content of our foods that are normally lost in the cooking process. Flavors are enhanced, and any acrid or bitter tastes associated with the foods are eliminated. The "fish" taste of seafood is also removed when you prepare and cook with alkaline water. Liver, Pork, Game meats, and Fish: Soak in alkaline water 20-30 minutes before cooking. Alkaline water softens (tenderizes) the meat and removes foul odors and the bitter taste or "bite".